Photo of Tim DeChristopher © 2010 Daphne Hougard. Forcing delays in the auction in the dying days of the Bush presidency, his action proved successful as most of the leases were subsequently cancelled by the Obama administration. However this environmental victory did nothing to prevent the legal system punishing DeChristopher for his principled audacity. In March 2011, an eight person jury – confined by the parameters set by the judge who disallowed any examination of his motives – found DeChristopher guilty. He will face sentencing on 23 June, and could face up to ten years in jail and up to $750,000 in fines. 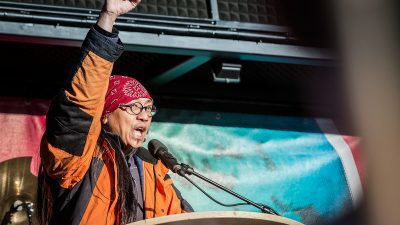 Since his arrest, DeChristopher has emerged as a leading and critical voice in the US environmental movement, calling for more radical direct action and slamming the major environmental groups for pursuing a strategy of ‘incrementalism’ that has not delivered results. He has also urged environmentalists to be honest and not pretend we can stop climate change; but instead look to stop its worst effects and make sure that we undermine the structures and corporations that will try to benefit from the climate crisis. Red Pepper writer Nick Buxton spoke with DeChristoper at a student-led conference on sustainability at the University of California of Davis on 30 April 2011. What were the influences that led you to disrupt the auction in Utah? Well I was always interested in the environment. After high school, I spent five and a half years working with so-called ‘troubled youth’, taking them out into the wilderness. It soon became clear to me that they were good kids, but ones who didn’t fit into a broken system. As I explored this, I could see that all decisions for organising the world were based around and argued in terms of economics, and that is why I went to study economics at Salt Lake University. While at university, I helped set up a group focused on outdoor conservation and recreation, and started to get involved in environmental campaigning and the fight against the climate crisis. By 2008, I had made a personal commitment to take direct action, such as the one I took at the oil and gas auction, if an opportunity presented itself. What did you learn from your experience of taking direct action? I went into the auction with the typical direct action mindset: that if I could take direct action to keep the oil in the ground then it would be worth it. I have since learned that the indirect impacts of direct action are even more powerful, in terms of inspiring others to take action and stimulating discussion on what our role as citizens should be. I also went in thinking that I was sacrificing my freedom by taking such an action. This is not really the case. The sacrifice had happened before: when I had spent years being obedient to a system that is powerful and destructive; when I accepted the myth I had no power to change things; when I voluntarily disempowered myself. The moment I fully resisted this system, I discovered real power and liberation. I would never go back. Why do you think environmental movements, particularly in the US, have been so ineffectual in mobilising an effective response to the greatest crisis humanity faces? I think it is because we are a nation of people who consume a lot, and have therefore become far too comfortable with the system to dare to change it. The main control the system has is through scaring people that they have too much to lose by challenging it, and that we need to hold on to what we have. I think also the problem is that we have too many rich people in the leadership of the environmental movement, who have benefited from the status quo. It is hard to change the world when you have little personal investment in changing it. 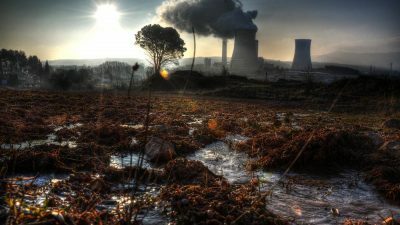 What do you say to the mainstream environmental groups, who argue that working within the system is the only way to deliver environmental policies? We have had plenty of opportunity to work within the system. In the 1980s and 1990s, asking the power structures to do the right thing was perhaps a reasonable strategy, but not any more. A huge amount of money has been spent and it has failed catastrophically. Environmental groups got into bed with corporations such as Shell and Dupont – in alliances such as the Climate Action Partnership – to produce a US climate bill last year that was worse than nothing, strengthened the fossil fuel industry and completely deflated the climate movement. The reality is that the green movement has spent a lot of time studying science and economics, but not history – understanding how change happens in this country. We can, for example, learn a great deal from the experiences of the Freedom Riders in the civil rights movement who decided to act and directly challenge bus segregation, against the advice of Martin Luther King who said it was a bad idea. The first group of students was repeatedly attacked and almost killed, but prior to their journey they had already sent a message to ask others to pick up where they left off. And they did. Students and activists soon filled the jails of Mississippi and they brought about an end to bus segregation. The key is they never had an end date to their actions, and they won. In the US, we are gearing up for a huge summer of direct action against coal, and particularly the devastating practice of mountain top removal in the Appalachian mountains. We have a huge march on Blair Mountain in early June, and then are calling on people to join a rolling programme of busloads of arrests every day after that over the summer. At a US youth environmental conference, called Powershift in April 2011, you caused a stir when you said we should face up to the truth that we have already lost the battle against climate change. Can you say more about this and the challenges environmental movements now face? Our challenge has changed. It is no longer about just reducing emissions. We have to work out how to hold on to our humanity as we head to increasingly difficult times. 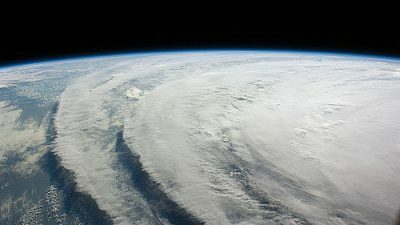 The turning point for me was when Terry Root, a lead author of the UN Intergovernmental Panel on Climate Change, told me privately after an event at Stanford University that it was too late to stop a climate crisis, that her generation had failed mine. I was shocked and asked why she had not said that on the public panel. And she said that she was scared that saying the truth would paralyse people. And it is true, what she said did first put me into a dark place of despair. I found myself mourning my own future, knowing it could be nothing like my parents. But sharing that grief with others, I found knowing the truth also empowered me to fight back in a more serious way. How should confronting that truth of climate change shape our actions? First I think it is crucial that we don’t reinforce current power structures. I received a letter after my Powershift conference speech saying that I should be careful not to dismiss those in power, saying that the US Department of Defence is a great ally because they recognise the dangers of climate change and are acting to address it. I don’t care if the military is taking climate change seriously. But you can be sure they are not a group whose power I want to reinforce when things become ugly. We can already see where the system has collapsed for economic or environmental reasons how power structures will respond. We saw this in Darfur where environmental catastrophe didn’t lead to everyone thinking, hey, this is clearly a sign that we must rethink how we live. Instead, it led to governing forces scapegoating certain groups, with deadly results. The greatest impact in Darfur was not the environmental catastrophe itself, but the response of those in power to it. So in all our actions we need to look to overturn these power structures. We should not be asking major corporations like Walmart or institutions like the military to be kinder and gentler. We need to start working now on putting in place power structures that share our values as we enter difficult times. When things get ugly, and access to resources becomes difficult, we want to have trust that those making decisions will act justly, and not just favour the strong. This will mean allying now not with people at the top who have caused the crisis; but with people at the bottom, in particular those who have suffered from climate change. We also need to stop being defensive against accusations that our demands will lead to damaging the economy. Mainstream green groups typically respond by talking about growth, green jobs, and the advantages for corporations of the green economy. But I believe we should embrace the charges. No, we are not trying to disrupt the economy, but yes we do want to turn it upside down. We should not try and hide our vision about what we want to change, of the healthy, just world that we wish to create. We are not looking for small shifts: we want a radical overhaul of our economy and society. I think once we start talking about it, we will find more allies than we expect: trade unions, health workers, LGBT groups and so on. Where do you think activists should invest their energies, locally or nationally? In a hyper-individualised society, it is no surprise that climate action has been focused up to now on personal responsibility to limit consumption. We receive typically about three thousand adverts every day to consume, so green consumption bolsters that. The mentality is that the problem is one of individual and consumer habits, and that the answer to the climate crisis is lifestyle changes. This reinforces the idea that our primary identity is as a consumer, and reinforces a system that is the main problem. How can we recover and assert a system based on us as human beings rather than consumers? A lot of us obviously start small-scale, local, in our social and environmental activities but we invariably come up against roadblocks imposed by the larger power structures. We can’t have a sustainable aspect of an unsustainable system. So we need to be clear from the outset that we want to change a larger system; to always challenge those roadblocks. Do you maintain hope in this situation? I have hope in the end in the ability of people to build a better world in the ashes of this one. I am not sure if that is a hopeful vision or not. However, the future is not determined and we can still shape it. I was born the year Reagan took office, and grew up in a world where corporations were all-powerful and it was accepted there was nothing you could do to challenge them. Yet we have seen just this year in the Middle East, and in Wisconsin in the US, that people power is not an idealistic concept. It is the only thing that can bring about real change. I know it will mean navigating the most intense period of change we have ever seen, but there is still a huge range in what our future could look like. That is why it is even more important to keep fighting.